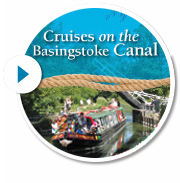 2016 was a big year for The Basingstoke Canal Society, during which two major anniversaries were celebrated. 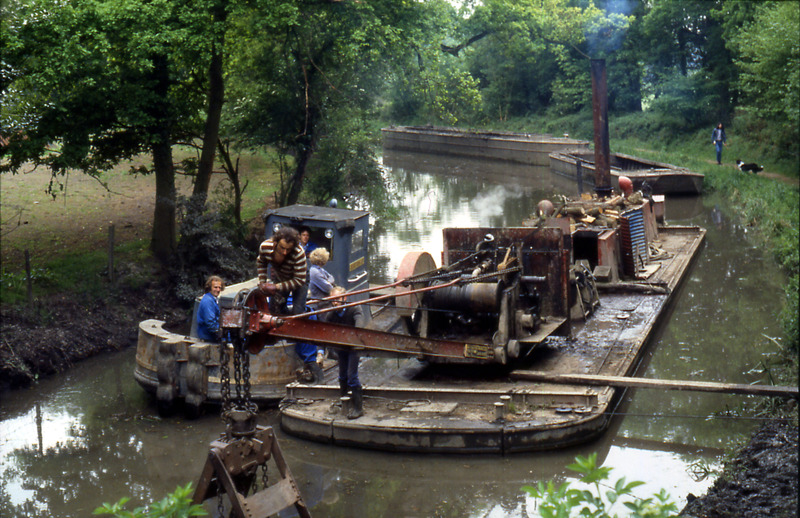 The Perseverance dredger, tug and mud barges working near Barley Mow, 1980. 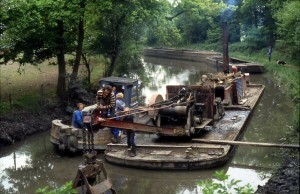 The Perseverance took 18 years to dredge the Canal from Greywell to Fleet, and then was decommissioned in 1993. Firstly, it marked the 50 years since 1966 when Brookwood resident Jim Woolgar posted a letter to a local newspaper to see if there was any interest in doing something about the then semi-derelict Canal. Some people responded and the result was the formation of the Surrey and Hampshire Canal Society. From these beginnings arose much campaigning to get the Canal into public ownership and eventually, following the acquisition of the western section by Hampshire county, restoration by Canal Society official volunteer work parties began in late 1973 (Surrey county followed suit and bought the eastern section a couple of years later). Work then carried on for nearly 20 years. Those wishing to read the full story of the restoration can refer to the numerous editions of the Basingstoke Canal News published during that period. 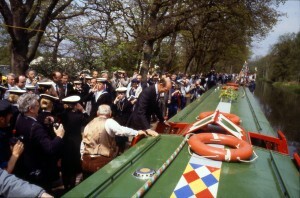 The other significant anniversary was 25 years since the formal re-opening of the Canal in 1991 (see right), the culmination of all those hundreds of man years of mainly volunteer effort. The result of this has been to create a highly attractive navigable waterway, general amenity, a heritage asset and a host to wealth of wildlife for the whole community to enjoy. Having achieved that much, the Society has continued to work with Surrey and Hampshire counties and their agent the Basingstoke Canal Authority to ensure a sustainable future for the Canal. These two important anniversaries were celebrated at the Woking Canal Festival in August 2016. We were fortunate that the Historic Narrow Boat Club joined us in force at this event, which was quite a spectacle. Their members brought around 40 historic boats to the Basingstoke as they too celebrated their 50th anniversary. In addition to the public event over the weekend, there was a private ceremony, a birthday party if you like, for Society members at which there was ample opportunity through presentations, film shows and socialising to look back at the activities of the Society over the previous 50 years. See here for more information on the 50th anniversary celebrations and Woking Canal Festival.